Lex Products is pleased to announce the launch of http://www.powerrampsbylex.com, a new website devoted to educating our customers on the quality and value of Lex Products’ 5-Channel heavy-duty PowerRAMPS®. These cable crossovers are used in the entertainment, industrial, shipyard, and military markets to protect cables and hoses from heavy traffic by pedestrians and vehicles. 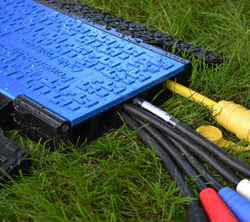 “Our cable ramps are unique to other brands, our center channel is wide and deep enough to accommodate 5 wire banded #2 AWG type SC cables for example. We felt that a website dedicated to informing consumers about the value these ramps bring to any worksite or entertainment events was important”, states Jack Hogarth - Product Manager at Lex Products.